is most suitable for my child? 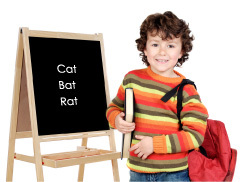 Sing Your Way Through Phonics CDs and Mini-Charts provide a host of phonemic awareness activities for parents who wish to help their students progress in reading and writing. To help parents decide where to begin, we’ve developed an assessment checklist that indicates the volume number and song that can serve as a starting point for helping your child become a skilled reader and writer. Read through the following list of skills. When you reach an item where your answer is “no” or “sometimes,” we suggest you begin working with that volume and phonics song. Visit our how parents use our products and lesson plan pages for additional guidance about teaching the phonics concepts. To get the most out of Sing Your Way Through Phonics CDs, students need a visual link to the printed word. We strongly recommend using our coordinated Mini-Charts to provide the critical visual link to print. Note: The symbol / / means “the sound of” the letter between the two slashes. Example: /b/ = the sound we pronounce at the beginning of the words boy and ball. jelly, jam=Jj kitten, kite=Kk Ready to Read Who Knows the Letter? pronounce the right sound when viewing the consonant letters? F or f is pronounced /f/ Vol. 1 What’s That Sound? fish begins with letter f or F Vol. 1 What’s That Sound? /o/ as hot, /u/ as bug Vol. 1 Oh, Do You Know? /o/ in boat, /u/ in rule Vol. 1 Oh, Do You Know? pronounce the consonant digraph sound when viewing the letters? pronounce the beginning consonant blend when viewing the letters? pronounce the ending consonant blend when viewing the letters? read and spell common w-h words which, what, who, whose, whom, why, where, when Vol. 3 Who Knows? funny/funnier/funniest Vol. 3 Why Does Y? move, moving Vol. 3 Drop It!